A range of short design courses suited for enthusiasts and budding designers of all ages. Based in the stunning English Riviera, our range of courses offer both the combination of a holiday setting and Design Studio tuition by top class professionals. The weekend course is hosted by internationally renowned designer Steve Harper and fellow Design professionals, at the SHADO Riviera Design Studio, Paignton, Devon. Tuition would be for all, whatever level of artistic skills, and would introduce you to the specialist sketch & rendering techniques used by designers. With numerous demonstrations and personal guidance, the course will develop your skills, plus, help you explore your own creativity and enthusiasm for the subject of Automotive & Product Design. The basic materials; paper, pens, pencils will be provided. These and other designer's tools, can be purchased at the end of the course if required. Scale and Full-size Clay models are used extensively throughout the Design Studios of the world, for both Exterior & Interior designs. Hosted by internationally renowned designer Steve Harper and clay-modeller colleague Tony Tovey, together with fellow professionals, in the SHADO Riviera Design Studio, Paignton, Devon, this updated version of the Course introduces you to those skills used by Design Clay Modelers. With 'One on One' guidance & tuition, together with demonstrations using scale models, full size exterior and interior panels, this Course offers you the chance to explore the specialist tools & techniques used, your own creativity, and provide you with the opportunity to investigate a new hobby or career. The basic materials; clay, clay rakes & slicks, radius sweeps, will be provided. Similar tool sets to those used, can be purchased during or after the course if required. This introductory Course is hosted by internationally renowned designer Steve Harper, together with fellow professionals, in the working environment of the SHADO Riviera Design Studio. 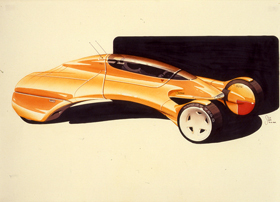 The Introduction in Design is ideal for people who would like to experience the world of Automotive and Product Design, and are interested in developing their sketching & creative skills and become proficient in the techniques used in a Design Studio. 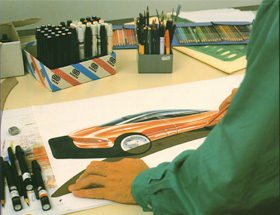 The Course offers tuition in design techniques, with numerous demonstrations of sketching & rendering techniques, guiding the student through the process of turning an idea into reality. Together with helping you explore your own creativity, it also would offer you the opportunity to further investigate a new hobby, or lead you towards a Higher Education Course or career. The basic materials; paper, pens, pencils, clay, clay rakes & slicks, radius sweeps, would be provided. Similar tools to those used, can be purchased during or after the Course if required. 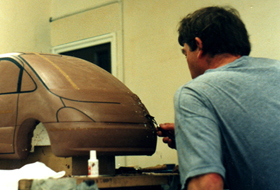 In Studios throughout the World, a Car, Van, Truck or Bus 3D design is still developed using clay models, which are crafted by a team of skilled modelers. The Master Class, hosted by internationally renowned professionals, at the working SHADO Design Studio in Paignton, Devon, offers you the opportunity to explore your own creativity in an authentic environment, provide you with some valuable experience and allow you to further investigate a new hobby or career. 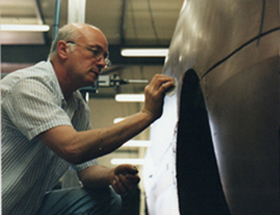 The 'One on One' tuition around realistic scale models and full-size Exterior & Interior panels, would enable you to gain knowledge of the specialist tools & techniques used by Automotive clay modelers, then let you develop your own skills, in all of these disciplines, up to the standard of a junior professional. The Design Master Class is a multi-disciplined Course, ideal for anyone who is serious about developing their all-round design skills. The 'One on One' Course offers in depth tuition in design techniques, an introduction to ALIAS computer aided design, as well as the opportunity to experience the tools & techniques of clay modeling. 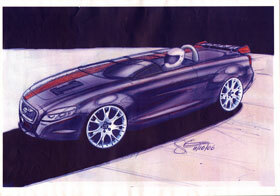 With numerous demonstrations of sketching & rendering techniques, tape drawing, ALIAS model construction and presentation tools, scale modeling, full size exterior and interior work, under direct personal guidance, it is ideal for all, whether a beginner, graduate or someone considering a mid-career change. All Courses include light lunches and run from 10am to 5pm. Due to regular request, we are now revising the availability of the new improved ‘One on One’ Course dates, to suit your own diary and availability. For instance the '2 day – Introduction to Design Sketching' can now be offered during consecutive week days, as well as over weekends. Also the 4 week Courses may be split into 2 x 2 week blocks, to allow the student some personal development time between sessions, in order to maximise their own learning process, or meet existing work / holiday restrictions. We can offer a list of recommended hotels in the area, from small and friendly B&Bs to luxury spa hotels, covering a range of budgets.